AUSTIN, Texas, Dec. 12, 2018 /PRNewswire/ -- Resideo Technologies, Inc. (NYSE: REZI) will establish its headquarters and a software development center at 901 E. Sixth St. in Austin. The state-of-the-art office building will become the new home for the smart home technology company and approximately 120 of its employees, including most of the company's executive leadership team. The headquarters, including a new customer experience center showcasing the latest products and technologies, is planned to open during the first half of 2019. "The Lone Star State continues to attract the best and most innovative companies from every sector of the economy, and I am thrilled that Resideo has chosen to be a part of our success story," said Texas Gov. Greg Abbott. "With low taxes, reasonable regulations, and a strong workforce, Texas has created an economic environment that allows businesses to flourish. I thank Resideo for their investment, and I look forward to working together to keep Texas the premier state for economic opportunity." At its new headquarters, Resideo will create nearly 100 new, in-demand jobs in software engineering, as well as marketing, sales, finance, and human resources. Resideo is expected to generate $20 million in economic impact annually in the Austin community, according to analysis by the Greater Austin Chamber of Commerce. "Resideo is a leader in smart home technology through our 100,000 professional contractors in the 'do-it-for-me' channel," said Mike Nefkens, president and CEO of Resideo. "Austin has a rich history and is packed with creative energy, making it the perfect fit as we merge the 130-year heritage of Resideo's Honeywell Home brand with next-generation technology to simplify the smart home experience." 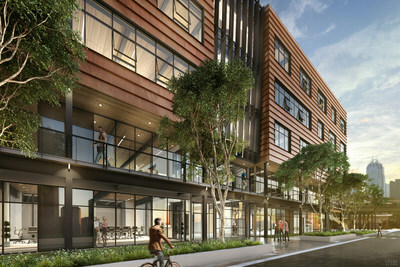 Resideo will occupy nearly 28,000 square feet in the five-story office building. Located in eclectic East Austin, the building is steps from boutique shopping, restaurants and park space, and boasts an outstanding walkability score and easy access to public transportation and I-35. Combining warmth and character with a modern warehouse style, the building features bright, open workspaces, secure bike storage, large wrap-around balconies, and operable windows, offering sweeping views of downtown. "Resideo's decision to place its headquarters in Austin is a big win for Opportunity Austin and the region," said Gary Farmer, Opportunity Austin Chair. "As the number one global distributor of security products and a leader in forward-looking technology, Resideo will feel right at home with our innovative tech culture. With smart home tech still in the early stages of adoption, the country will look to an Austin-based company to lead the way." Resideo is a leading global provider of critical comfort and security solutions primarily in residential environments, and distributor of low-voltage and security products. Building on a 130-year heritage, Resideo has a presence in more than 150 million homes, with 15 million systems installed in homes each year. The company has a 40-year, exclusive license to use the Honeywell Home brand for products and will continue to serve more than 100,000 contractors through its ADI Global Distribution business, which exports to more than 100 countries from more than 200 stocking locations around the world. Resideo is a $4.8 billion company with approximately 14,500 global employees. For more information about Resideo, please visit www.resideo.com.